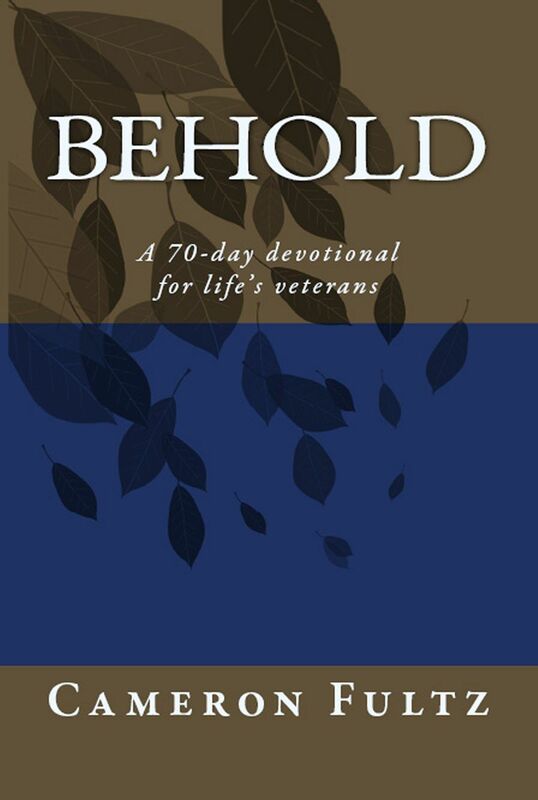 Cameron has been working on a new book, a devotional called Behold: A 70-day devotional for life’s veterans. Behold gathers Bible passages containing the word “behold” or the concept of beholding. To behold is more than to see. It is to gaze intently, to gaze until spiritual transformation happens in the soul. Of course, transformation only occurs when you behold the right object. Many a disciplined navel gazer has never changed at all 😉 But if we behold Christ by the Holy Spirit, we will be transformed into that same image (2 Cor. 3:18). Below are a couple entries from the book. If you like what you read, I would encourage you to get the whole book. There is a power of godliness and an appearance of godliness. The power of godliness is being actively saved by Jesus’s crucified nature dwelling richly in your heart. Paul defines it well in 1 Corinthians 1 & 2. There is the wisdom of men (outward appearance) and the power of God (Jesus, the Treasure inside). These correspond to a natural understanding or a spiritual understanding (2:10-16). The natural understanding sees by fleshly senses; the spiritual is by the Spirit to impart spiritual understanding. Paul calls it the “word / message of the cross” (1:18) and its power is to only know “Jesus Christ and Him crucified” (2:2). The mind of Christ (2:16) is the selfless-giving, slain-Lamb nature. This is the current living dynamic of the cross that is available to all since the historic event. The appearance of godliness looks like it has the above but there is no fruit of the crucified life. There is no emphasis on denying / hating / losing self. The old beast nature is still alive under the veneer of godliness. The old beast nature makes every good and “godly” decision with self-benefit. Doctrines of men get argued about. Churches split for the appearance of something. People get fought over between ministries (“that’s my territory – that’s what the “godly” beast says). The godly beast loves to control people and shut down underlings from talking too much or embarrassing them…all for God’s kingdom, of course. That is the meaning of “lovers of self”. It is not about some punk on the street smoking crack, but it is a church leadership structure. When Paul wrote this passage I suspect he had Korah’s rebellion in the back of his mind (Numbers 16). Moses was more humble than any other man on earth (Numbers 12:3) and Philippians 2 deals with Christ’s humility. It is through such a humble heart that unity is maintained. But there are those who preach Christ that are “opponents” because they seek their own interests like Korah’s. Christ never sought his own interest. Understanding that comes from the Tree of Life can’t seek its own interest – it only carries out the life expression of the source like a branch to a trunk. That is the clear sign that we need to behold in church leadership. Understanding from the Tree of Life is completely opposite of understanding from the Tree of knowing good and evil relative to self-interest. It is impossible to operate by both. A vacuum cleaner can’t be sucking in and blowing out through its hose pipe at the same time. The human problem is that we all act according to self-interest. It doesn’t change when people become Christians; they just couch it in holy terms like Korah did in Numbers 16:3. Control is usually the problem. Humility like Moses’s is the answer; but it can’t be forced. That old way must die off like the first generation out of Egypt and like Korah’s rebellion. They are historic examples for us today. The death is not physical, but of the inward person. Humility clears us out of the way so that Christ’s Presence can have dominion inside. Instead of doing our own thing, we only do what Jesus shows us (John 5:19).